Wimbledon emojis: use at your discretion. Twitter has announced a new set of Wimbledon-themed emoji via the timeline of Serena Williams. The new characters are part of a broader push to get fans engaging on social media during the tournament. 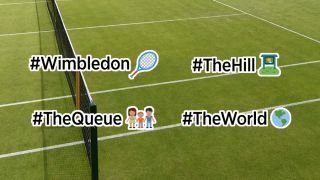 Aside from #Wimbledon (which brings up a tennis racquet), the hashtags let you broadcast where you're watching from: #TheQueue, #TheHill (Henman Hill) or #TheWorld (anywhere outside SW19). Twitter says it wants to create "a friendly battle of conversation" between fans no matter where they're watching, and there will be more emoji characters available as the tournament progresses. Twitter knows that live sports (or live events of any description) are where it still has the edge over the likes of Facebook and Instagram. It's also trying to capitalise with special promotions on Periscope and Vine. To get people engaged, you can try and get your face on the big screen at Wimbledon by tweeting a selfie with the hashtag #TheHill. There's also a large topiary @Wimbledon sign to take photos next to. It's not the first time that Twitter has introduced custom emoji either: you might remember a few new symbols popping up to promote the upcoming Star Wars film The Force Awakens. With CEO resignation, is Twitter ripe for Google's taking?